How many of us as children wondered on our way to a game, “…what is the chance…?” “Will we get a view from the hallway…just a peek in the door to see our favorite player or team?” If we were really lucky, perhaps we saw them lacing up their skates, putting on their gloves or taping their stick. All rinks and team rooms have their own character and personality. 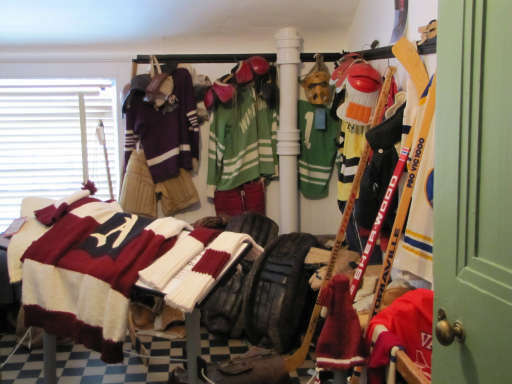 The Locker Room of the Hockey Heritage Center provides its best to stir your memory and sense of being there in the old dressing room of great teams and players. The gear and uniforms, sticks and equipment are presented for the delight of your own imagination. Here we have a view of the history of hockey through a locker room’s doors. 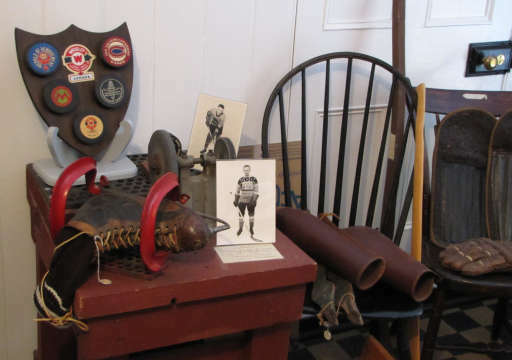 Complete with the skate sharpener’s grinder, a pair of original shin pads, sausage-finger gloves and an image of a local hero and NHL player “Doggie Kuhn”. 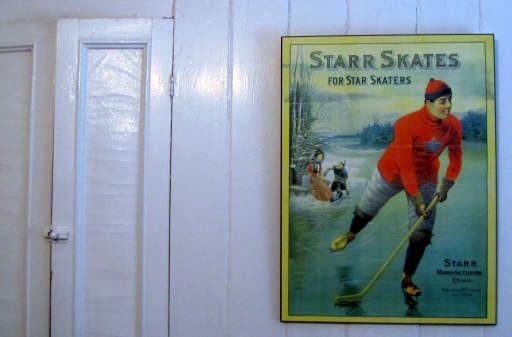 A full size poster of the original Starr Skates in poster format. The skates were produced by Starr Manufacturing of Dartmouth, Nova Scotia. The Starr Skates were one of the most popular brand of skate in its day.